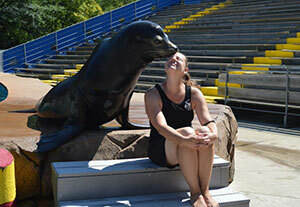 Oceans of Fun Seal and Sea Lion Show, sponsored by Anderson Seal LLC, at the Milwaukee County Zoo, is proud to celebrate the 30th birthday of one of its male California sea lions, Slick. It will mark this very special milestone by highlighting Slick in all of the Oceans of Fun shows taking place Memorial Day weekend, May 28th through May 30th. 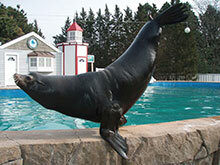 Currently, Slick is in great health, participates in public shows at his leisure, sets his own schedule, and has the added advantage of being close to other younger marine mammals who are a part of the Oceans of Fun family. “Slick has lived a long and fulfilling life at Oceans of Fun, and now it’s his time to enjoy “retirement;” he’s definitely earned it. As a V.I.P. in Milwaukee and an ambassador for marine mammals in the wild, he’s spent his life educating hundreds of thousands of guests on the importance of conserving all marine mammals,” comments Ballmann. Oceans of Fun and the Zoo invite visitors to join in this very special birthday, and to celebrate Slick as a very remarkable animal. Shows take place at 10:30 a.m., noon, 1:30 p.m. and 3:00 p.m.; cost is $2.50 per person. For more information, please contact the Zoo’s Marketing and Communications Division at 414.256.5411.